Nikon’s My PictureTown service has been running for a while now, but it still hasn’t pulled in the users that the other sharing services have. There has been some work to change that though, Nikon just announced several upgrades to the service, which will allow users to create PhotoMovies, as well as an improved user interface and more sharing options. Along with the PhotoMovie and sharing options, Nikon also redesigned the My PictureTown home page, enhanced the MyPhotos area, and added the ability to incorporate designs in to the MyPhoto page area. Nikon also added the ability to share photos on Facebook using the upload function. The basic service gives a user 2GB of storage and the ability to create one PhotoMovie – a slideshow with transition effects and music. The Gold level service costs $2.99 a month, and ups the storage to 20GB, and the ability to create an unlimited number of PhotoMovies. Additional space is available at $2.99 increments, with a 20GB increase for each step up to 200GB. Melville, N.Y., October 12, 2010 – Today, Nikon Inc. launched a new version of its image sharing and storage service, my Picturetown (www.mypicturetown.com), with improved sharing and creativity tools. The site features design, navigation and functionality improvements to enhance the user’s overall photo and video experience. Among the new features is the PhotoMovie function that allows my Picturetown members to create a dynamic slide show of photos that can be combined with text, music, and special effects. This service allows users to include their favorite memories in a PhotoMovie that can be easily shared with friends and family through email or popular social networks. The tool is a unique alternative to posting single pictures and adds the ability to tell a story and share memorable moments through multiple photos, captions, and royalty-free music available on the site. Other improvements include a redesigned homepage, an enhanced “My Photos” page, and the option to add designs to shared albums. Once logged in, a member’s homepage can be decorated with a random assortment of previously uploaded photos for a personal touch that continues to entertain as more photos are uploaded. Members can also access and share their photos stress-free with the improved “My Photos” page, which now lets users view thousands of photos on one page, organize photos with a simple drag-and-drop operation, and share photos through a Facebook uploading function. Members can also personalize their online albums with 18 design options to share with family and friends. Nikon’s my Picturetown is a free service for consumers storing and sharing two gigabytes (2GB) worth of their photos and videos and offers Gold account paid membership for storage capacity of 20GB to 200GB. New and existing free account members have the opportunity to create one free PhotoMovie and Gold account members can create and share an unlimited amount of PhotoMovies. Throughout the holiday season Nikon will offer special incentives and promotions for new account members and create opportunities for consumers to contribute to photo sharing on the my Picturetown site. 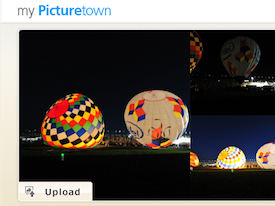 Since its launch three years ago, my Picturetown has been helping its members share, store, and enjoy their digital photos. Memberships have grown to nearly 1,000,000 and are currently expanding with the continued development of my Picturetown’s functions and services. Users have the option of activating a free account enabling them up to two gigabytes (2GB) of storage or purchasing a Gold membership with a fee charge* that allows up to 200GB storage in units of 20GB each. To sign up for my Picturetown, please visit www.mypicturetown.com.